Sharkoon introduces the Shark Blades series of fans. These fans feature a 3D frame for optimal airflow, shark fins, and hydrodynamic bearings. They spin at 1000RPM, output 56m³/h and have a noise level of 19dBA. 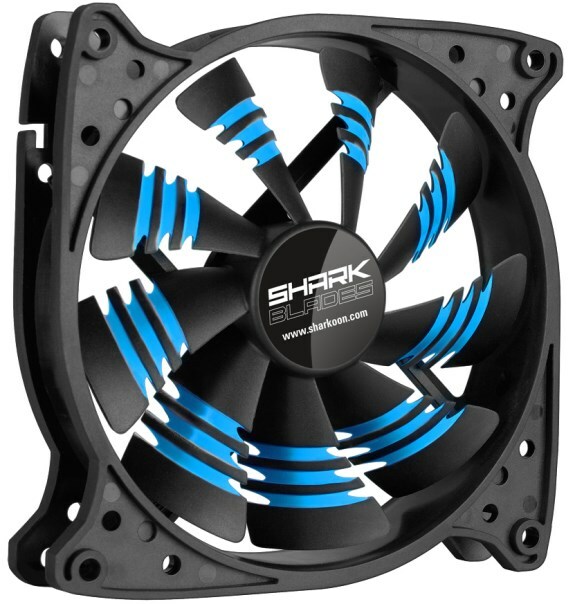 Sharkoon expands its range of products for computer enthusiasts and introduces the Shark Blades fan series in four different color variations. The 120 mm silent fan, measuring 120 x 120 x 25 mm (L x W x H), has a fan speed of 1000 revolutions per minute, with a maximum flow rate of 56 m³/h. The Shark Blades are equipped with a quiet 12 volt motor with a durable hydrodynamic bearing, which is designed for an average life span of up to 50,000 hours. Special fan blades in the shark fin design not only provide an interesting 3D effect during fan use, but also stable airflow with reduced air resistance, thus preventing turbulence. Also, the fan blades are arranged precisely on the wheel, in order to prevent the slightest bit of vibration. Delivery includes a set of rubber bolts for decoupled and screwless installation. The fan is connected via the 50 cm long, textile-coated cable, with 3-pin plug for a temperature-sensitive control of the mainboard. Also included is a power supply adapter (3-pin to 4-pin power connector) and screws. The Shark Blades are available in the colors black/yellow, black/red, black/blue and black/green. End customers will find the Sharkoon Shark Blades fan series for the suggested retail price of 12.99 euros in authorized retailers.